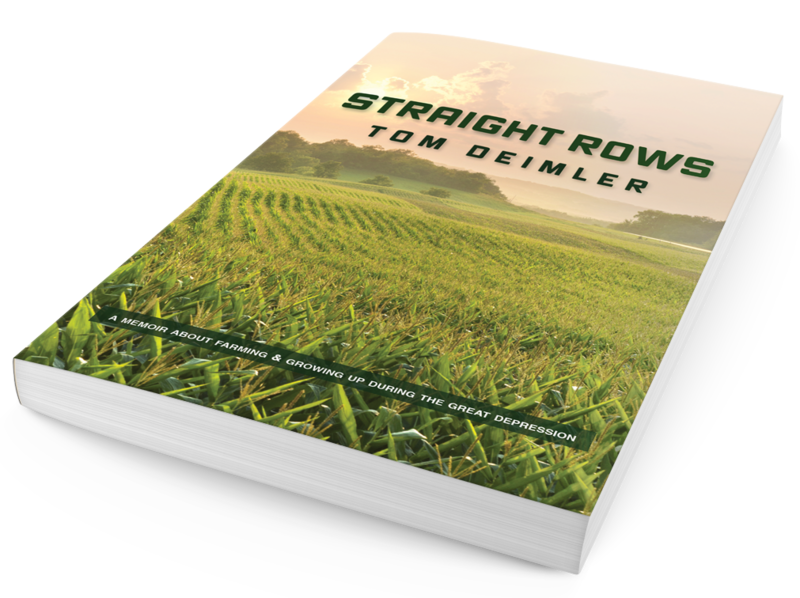 Straight Rows: Sample Chapter: "The Farm"
Around 1930, Dad acquired the farm from his father, Isaac Deimler for about $3000. The land we owned consisted of twenty three acres which included a house, garage, barn and several poultry buildings. Mom worked alongside Dad to run the farm, and my brother, sister, and I had daily chores to perform. The farm was located in central Pennsylvania, Route 441, near Middletown. My older brother, Bill, and I were born on the farm while my younger sister, Peggy, was born in Polyclinic Hospital in Harrisburg. We lived there through our high school years. It was here that I learned the value of hard work. I was taught that anything worth doing was worth doing right. My Grandpa Deimler, Isaac Ober Deimler, passed away in 1938, at age 67 when I was only three and one half years old. He was not a direct influence in my life. However, I am told by my parents the he often held me on his knee, and occupied me playfully when Mom was busy with other work. It is important to mention that his imprint was obvious on our farm. He was a hard worker and set the pace for the daily chores. 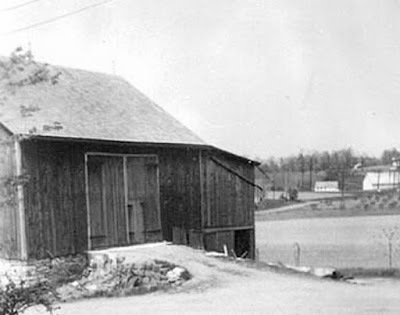 As the original owner, he helped to construct many of the poultry buildings and a pig pen addition to the barn. Isaac was very progressive for his time. He installed a wind generator which charged batteries. This provided electricity for the house, barn and other buildings. Later on, he and two neighbors, Isaac Coble and Horace Strayer, built a power line from Middletown to provide electricity to their farms. Grandpa and Dad constructed a large two-floor chicken house to raise layers for egg production and broilers for butchering. The chicken house was equipped with electric brooders and a furnace to provide hot water heat. He borrowed on his life insurance to pay for these and later paid it back. It is interesting to note that the chickens lived in a more modern setting than the family. Home improvements came at a later time when additional funds became available. In that very rural area of Pennsylvania, we were isolated from the world. Our nearest friends were a couple miles away on a neighboring farm. Bicycles were our primary mode of transportation until age sixteen when we got our drivers license. My brother and I often biked to a friend’s house, either Harry or Junie. Both were about our age. These visits were most often on a Sunday afternoon, our weekly break from work. All three of us kids went to elementary school in a nearby one-room schoolhouse where we had the same teacher throughout our first eight years of formal education. On most days, we walked the one mile distance to and from school. In the evening, the students formed a line to walk along the edge of the road. The student living the farthest away was the safety patrol leader and the closest was at the end. Farming requires a strong family. It must be one that works together to get the job completed. Ours was a meager lifestyle with very little except for the bare necessities. It was a “hardscrabble life,” but I never knew I was poor! The kitchen was the heartbeat of all that happened on the farm. Mom cooked on a wood stove, which was also the source of heat in the cold winter months. At harvest time, at least twelve people were crammed around the dining table. My grandmother often was the chief cook because my mom was out working the farm with my dad. Neighbors, hired workers, family—everyone gathered and enjoyed a large meal and the work at hand. Meals on the farm tended to be satisfying and could include scrapple, pudding or sausage for breakfast; fried chicken, pork chops, ham or hog maul at lunch or dinner. Scrapple was a gelled meat that Mom or Grandma fried. Pudding wasn’t sweet at all, but a delicacy made from ground and boiled meat, which included the bones, head and organ meats. Nothing went to waste on the farm. Because all three daily meals were cooked on the big, rustic wood stove, the kitchen stayed quite warm and our family tended to gather here. Rising heat from the stove rose through a vent to the second floor which heated the bedroom I shared with my brother, Bill. In the hot months of summer we did not cook in the kitchen nor spend as much time there. Instead, the summer kitchen, which we called the “shed”, became an area of much activity. Mom had a kerosene stove here where she did all the cooking during June to September and canned everything we grew which included making her own sauerkraut, ketchup and many different kinds of jams and jellies, and she even cured ham. Behind the rocker near the wood stove in the kitchen was a large woodbox that had to be filled every day. My first task each afternoon, upon returning home from school, was to split the wood into just the right size to fit into the kitchen stove opening. Logs were cut in the summer by Dad and stored in a large woodshed with a roof that kept them dry. After splitting the wood, I hauled it in a wheel barrow from the wood shed about a hundred or more yards from the house. On the back porch was an “ice box” refrigerator. The cooling method was quite effective as the large block of ice, which accounted for one third of the inside space, kept our food cold. One of the highlights as a child was the twice weekly arrival of the “ice-man”. He drove a truck about the size of a dump truck. On it was loaded very large pieces of ice covered with heavy tarps for insulation. He knew the exact size to cut then separated a chunk from the main piece very quickly with an ice pick. The exciting part for us was all of the little slivers of ice from the cutting—ours for the taking. We would gather hands full! Boy were those refreshing on a hot summer day! Until I was eight, there was no running water in the house except for one faucet and a small sink in the kitchen. A “bath” might consist of huddling around the kitchen sink with wash cloth, soap and towel. In the summer we bathed outside in a galvanized tub, or sometimes in the shed. I don’t remember being modest, which I guess was a good thing! Our toilet was an outside “two-holer,” as they were called. Making the trek to this antique structure was a shivering experience on a cold winter’s night in January, especially with a two foot deep blanket of snow covering the ground. Regular “tissue” was very rare but the old seed catalogs served us well. Dad was past the age eligible to have joined the military to fight in World War II, so instead he worked at the nearby Air Force Base in Middletown. Money became a little more plentiful and at last there were enough funds to install a furnace and bath. Sometime in the early nineteen forties, when I was about eight years old, a radiator heating system was finally installed. The coal fuel for the large coal furnace was delivered on a dump truck and came into the basement on a metal chute which dumped into a large storage bin. Dad shoveled the coal into the furnace every morning and evening all winter long. Our first bathroom with running water, including toilet, tub and shower, also was installed at this time. The farmhouse was large enough that it supported private quarters for my grandparents who helped run the farm until they passed. It had a total of eleven rooms, three porches and two large walk-in closets on the second floor. A gigantic attic was on the third floor where many interesting relics were stored. Although they had their own small kitchen and dining room, Grandma and Grandpa still ate many meals with us, especially during harvest time when my grandmother did most of the cooking. Close to their porch door was what we called the “Bosh.” This was a German word that described a water cistern. The rain spouts were directed to this water-proofed cistern and my grandmother dipped water from it to wash her clothing as well as her hair. The two-story garage housed the pickup truck and a large upstairs workshop with every tool imaginable. The garage bays were mostly used for slaughtering and preparing turkeys and chickens, either for our personal use or for sale. Two mules, one or two cows and a couple of calfs lived in the bottom level of the barn. A barnyard joined that part of the barn, and was large enough for the animals to exercise daily. Large piles of manure from cleaning their stalls each day occupied a part of that area. This was later forked into a manure spreader and hauled into the fields. There was also enough space for a large storage room in the bottom level corner of the barn that housed our annual potato crop. This room was partially underground as the barn itself sat on the lower side of a small hill. The walls were insulated with plastic, and the window was also sealed. Potatoes like a cool temperature, but temperatures below freezing meant they would spoil or rot. Hay and straw for the animals, as well as grain and mash for the poultry, were stored on the second floor of the barn. There was an opening through which to pass the hay and straw into the lower level. I forked hay and straw down the open chute each day. The very heavy weight of the second-floor stores strained the sturdy beams. We raised all of the hay, straw, corn and wheat ourselves for the animals and poultry, with it just lasting until spring. A storage area that housed cultivators, extra farm equipment and a long pig pen were attached to the barn. Six living areas each housed four pigs for a total of twenty four pigs at any given time. As soon as the pigs were sold at market, the pens were cleaned and readied for the next herd. Rats, mice and English sparrows were the main culprits of disease and damage on the farm to both livestock and cash crops. The sparrows carried a disease—blackhead—to which turkeys were very susceptible and resulted in high mortality rate in both chickens and turkeys. Birds would fly into the pens and eat grain from the feeders, passing the disease through contaminated feed. Rats also carried disease, but mostly chewed holes in grain and mash bags and would eat in the grain bins. Dad did not use any form of poison to rid these pests so my brother and I were paid five cents per killed rat and a penny for mice and sparrows. Cats were also vital in the reduction of rodents. Like all of us, they earned their keep. The number of cats we had always varied and actually a count was never kept. There was one cat we named Mama who was always near the back porch. Daily she would proudly display her kills from the previous evening. Every morning there would be a rat skin turned inside out in plain sight for all to admire. Dad rented about fifteen acres from Mrs. Mildred Strayer, a neighbor just across the road. Here, we planted many vegetables for the farmer’s market and Mom’s peddle route. We farmed “for the half”—that is, sharing expenses and dividing the harvest—about forty acres owned by Grant Auch, father of my Aunt Dot, my mom’s sister-in-law. Our own twenty three acres was largely a vegetable farm with nearly every variety of vegetable. Five hundred peach trees in an orchard accompanied by a few cherry trees rounded out the growing season. In the late winter, pruning the peach trees was a major job. Dad did the cutting and Bill and I gathered the loose branches and hauled them to the brush pile for burning. Mom drove our pickup truck loaded with fruit and vegetables to the farmer’s market on Saturdays, did her peddle route door-to-door, and her wholesale route to the grocery stores in the nearby community of Middletown each twice a week. Each year we raised about 1,200 turkeys for the Thanksgiving, Christmas and New Years market. This required several large turkey pens that were constructed about five feet above the ground so as to keep their feet off of soil that may have been contaminated by chickens. Keeping them healthy made turkeys a challenge to grow. A large double floor chicken house was for our layers and accommodated about 1,000 female chickens. Each year 300 baby chicks arrived. Dad only kept the layers for three years and in the spring the oldest laying chickens were sold for butchering. The chicks were initially put into empty pens and in the summer were moved out on a grass field. They ranged there until frost at which time they would start laying eggs. Structures built in A-frame style with open sides and ends housed them during this period. The chickens ran free during the day and returned to the small range houses with doors closed at night. They were later moved to the main chicken building where our family had worked together to make sure it was cleaned thoroughly. Lime was spread to help keep the floors and roost area dry and to control disease. The dirt and lime made this a dusty job and I ended with coughing and watering eyes. It was my job to take care of the chickens on a daily basis which included feeding and gathering of the eggs. Working in the shed, Grandmother checked every egg for cracks and dirt, and carefully spot-cleaned them with a wet cloth. The eggs left in a wire basket were then carried to the main basement where they were packed to be sold. Dad carefully graded them into large, medium and small sizes. He did most of it by sight but often used a scale to double check. Egg production was our only year-round “cash crop,” and the egg retailer picked them up at the farm twice a week paying upon receipt of the eggs.